Reality is too stupid for words anymore. I’m running out of things to say in the Trump Era because every day is progressively dumber than the previous one, and frankly, the only cogent analysis remaining can be done by the @infinite_scream Twitter account. All joking aside, these leaks are harrowing, because they demonstrate an administrative staff terrified of what their boss will do next. Axios' Jonathan Swan is one of the most connected journalists out there, and he is reporting an aura of shock and awe in the White House. Per @kaitlancollins Trump was angrily phoning around last night asking allies who they thought might have leaked the info about his Putin call. The leak reinforced his belief that people in his admin are trying to undermine him. To be fair to Trump (*gag*), this is a pretty stunning leak, and I would think someone was out to get me too. However, the reasons why seem pretty justified, as the former CIA Director shockingly stated on MSNBC. This goes beyond personal distaste now. 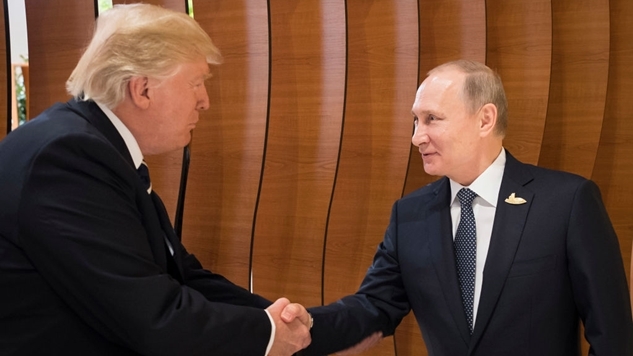 Advisers are leaking notes in response to Trump cuddling up to the Russian despot, and former intelligence officers are openly wondering if the American President is beholden to a Russian dictator. As funny as ignoring “DO NOT CONGRATULATE” is, the reason(s) why Trump did it should all give us pause.